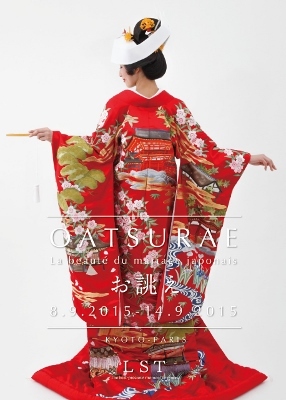 We are going to have an exhibition named “LST OATSURAE-TEN PARIS” from 8th (Tue) to 14th (Mon) September in Paris. It will have Shiro-Muku (all white kimono) and Iro-Uchikake on display and visitors can try the wedding costume with Katsura (hair wig). We are going to exhibit some furniture from our shop “LST BOTAN” as well. I am so thrilled to attend the exhibition as a Japanese style wedding planner. It is the first time for me to introduce “WAKON (traditional Japanese wedding)” to the people in overseas and I am really looking forward to it. For the details of the exhibition, please click below.